CHANDIGARH, Sept 6  The war of words between the Chief Ministers of Punjab and Haryana has hotted up with Mr Bansi Lal joining issue with Mr Parkash Singh Badal over the sharing of river waters and Punjab's claim over Chandigarh. FATEHABAD, Sept 6  Addressing a public meeting at Bhodia Khera village, Mr Krishan Swaroop, member of the state secretariat of the CPM, today said that the BJP government at the Centre had failed to live up to its promises. JIND, Sept 6  Mr Bansi Lal, Haryana Chief Minister, presided over the district public relations and grievances committee meeting here last evening and listened to the complaints of people. HISAR, Sept 6  The national convenor of the Bajrang Dal, Dr Surinder Jain, today demanded action against police officials involved in Friday's lathi charge on members of a particular community outside a disputed religious structure. HISAR, Sept 6  The on-going rift between two factions of the local Arya Samaj deepened further with one of the factions announcing Mr Baldev Raj Tayal as its administrator. ROHTAK, Sept 6  A majority of freedom fighters in Haryana are unhappy and dissatisfied with the present treatment given to them by the state government and the facilities available to them. They will contemplate on launching an agitation if their demands are not met with by the authorities soon. ROHTAK, Sept 6  A former Home Minister of Haryana, Mr Subash Batra, has demanded the removal of the Urban Development Minister, Mr Sri Kishan Dass, from the Cabinet following the registration of a criminal case against him recently. SIRSA, Sept 6  Inmates of the local district jail, in a complaint to the government, have alleged that the water being supplied to them is contaminated and unfit for consumption. They said several inmates had fallen victim to skin and stomach problems. AMBALA, Sept 6  The Sessions Judge, Mr A. S. Garg, has dismissed the anticipatory bail applications of Jagjit Kaur, Narain Singh and Harmit Singh against whom a case of cheating had been registered under Sections 420, 406, 408, 465, 468, 471 and 120-B of the IPC. ROHTAK, Sept 6  Commotion and pandemonium marked the meeting of the Vaish Education Society here today. The police had to intervene to settle down things as members of two groups levelled allegations against each other and even came to exchange blows. ROHTAK, Sept 6  Gaurav Deep Hooda, a son of former minister of Haryana, Mr Krishan Murti Hooda, allegedly tried to commit suicide by taking poison in Delhi yesterday. The police had registered a case of abduction of a girl against him and four others on Friday here. SONEPAT, Sept 6  This fast growing district headquarters in Haryana has been spruced up in connection with the visit of the Chief Minister, Mr Bansi Lal. The Chief Minister will address a party workers meeting here tomorrow. Reacting sharply to Mr Badal's statement declining to share the river waters of Punjab with neighbouring states, Mr Bansi Lal said here today that the Punjab Government was in the habit of backing out of every issue on one pretext or the other. Describing Mr Badal's statement as a hoax meant to justify the usurping Haryana's power and water, Mr Bansi Lal said there had been several awards and agreements on inter-state water and territorial issues, but the Punjab Government had always failed to implement them in letter and spirit. 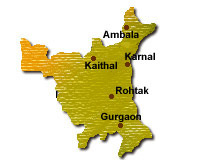 Haryana, being a successor state of the erstwhile state of Punjab and also a part of the Indus basin, had equal rights over the Ravi-Beas river waters. Punjab could not claim exclusive rights over these waters. Pointing out that the Eradi Tribunal was set up under the Rajiv-Longowal accord the Haryana Chief Minister said the Punjab Government had been participating in all the proceedings of the tribunal, which had already delivered its award indicating the share of various states in river waters. Mr Bansi Lal said the Shah Commission based its recommendations awarding Kharar tehsil, including the Chandigarh capitol project, to Haryana on the principle of equity. But in respect of the territorial issue also the Punjab Government had been repeatedly changing its stand. He demanded immediate implementation of the Shah Commission recommendations as well as the Eradi Tribunal award in toto. A central agency should construct the remaining portion of the SYL canal as this was the only way to settle the inter state water dispute pending for a long time. He expressed concern over the fact that the control of headworks at Harike, Ropar and Ferozepore had not been transferred to the Bhakra-Beas Management Board by Punjab even though it was obliged to do so under Section 79 of the Punjab Reorganisation Act, 1966. Mr Bansi Lal also criticised Punjab for not maintaining the Bhakra Main Line and the Narwana branch canals to give Haryana its legitimate share of water despite the fact that the latter had deposited Rs 7.13 crore with Punjab to undertake special repair of these canals in Punjab territory. FATEHABAD, Sept 6  The "Delhi rally jatha" of the CPM reached Bhodia Khera village of this district this morning. The 'jatha' which started from Mandi Dabwali town near the Punjab border on September 2 will reach Delhi on September 16 to attend the rally to be addressed by CPM General Secretary Mr Harkishen Singh Surjeet. Addressing a public meeting at Bhodia Khera village, Mr Krishan Swaroop, member of the state secretariat of the CPM said that the BJP government at the Centre had failed to live upto its promises. He said the party that had come in power on the promise of "Swaraj and Suraj but had failed to protect the interests of the people. He said that the Vajpayee government was the weakest government ever, with political parties pulling its legs from all directions. Lashing out at the HVP-BJP government in Haryana, Mr Krishan Swaroop said the state government had failed to live up to the expectations of the people and had been curbing their rights through government machinery. Peacefully agitating employees had been dealt with under the draconian laws like the ESMA. Mr Harpal Singh, a former legislator and Mr Ram Kumar Bahbalpuria also spoke on the occasion. The 'jatha' entered the district on Saturday morning from Pilimandori village and organised public meetings at Thuian, Mehuwala, Dhingsara, Jandwala, Ramsara, Dhabi Kalan, Bhattu Kalan, Dhani Khurd, Sirdhan, Bangaon and Bighar villages. On a complaint of Mr Krishan Kumar of Model Town, Narwana, the Chief Minister suspended a District Town Planner, (DTP) Mr Dhara Singh. Mr Krishan Kumar said he had submitted a plan for construction of his house after completing all formalities and had started constructing his house on the verbal assurance of the DTP. But the DTP returned his plan after raising some objections. The City Magistrate who was entrusted with the inquiry of the case, on finding the complaint genuine, suspended the DTP. The Chief Minister also ordered the transfer of the SDO, Irrigation Department, posted at Dhamtanm village to Chandigarh for ignoring the complaints of people. On the complaint of Mr Ram Kumar of Rattakhera village, whose son had been electrocuted two years ago, the Chief Minister ordered the Electricity Department to pay compensation to the complainant within 15 days. He ordered the SDM Jind, to enquire into the cause of accumulation of sullage water near the local Mahavir Jain School. On the issue of dilapidated government office buildings of Narwana, Mr Bansi Lal said the proposal to construct a mini-secretariat at Narwana would be considered. Regarding floods in some villages of Jind district the Chief Minister assured that a plan to drain out the flood-water would be made. Mr Brij Mohan Singla, Industrial Training and Vocational Education Minister and Housing Minister Satya Narayan Lather were also present. Addressing a press conference here today, Dr Jain alleged misbehaviour by the policemen with protesting women. He said, despite knowing that most protesters were women, the local administration did not deem it necessary to depute the lady police. He charged the local administration of being prejudiced. The Bajrang Dal convenor claimed that the police mercilessly manhandled the devotees who had come to perform religious rites. He said it had been continuous practice there that the people would visit and perform puja at the place. But some over-enthusiastic policemen resorted to lathi charge and created tension in the locality. Dr Jain demanded the release of all those arrested and withdrawal of cases. He warned of a statewide agitation, if the Hisar administration did not stop harassment of members of particular community. It may be recalled that 24 persons were booked for rioting and six of them including three women, arrested after they allegedly demolished the outer wall of a disputed religious structure in Tibha Dhana Sher here on Friday night. The rift started after the term of Mr Hari Singh Saini ended recently, and he handed charge to Mr Sita Ram Arya. However, the rival group did not accept him as the administrator. Today, they declared Mr Tayal as the administrator. This was preceded by angry arguments between the supporters of Mr Saini and Mr Tayal. The Arya Samaj has huge assets with a minimum recurring income of Rs 1.5 lakh per annum and there is a continuous tussle between the two factions for its control. The two groups are backed by two separate factions of the Sarvedeshi Karya Samiti in Delhi. The officials of the local Arya Samaj have also been claiming to be independent of the Sardeshi Karya Samiti, Delhi. Both factions had come today with their supporters for taking control of the complex. However, the faction led by Mr Saini withdrew to prevent showdown. While he was still addressing his supporters, outside the complex, the group led by Mr Tayal declared its control over the complex. This was decided at the state-level meeting of the Haryana Freedom Fighters Association held here today under the chairmanship of Mr Roshan Lal Vyas. The speakers at the meeting expressed resentment over the alleged indifferent attitude of the state government towards them. They charged that freedom fighters and their dependents had been lying neglected as their interests had been ignored by the authorities during the past few years. They said their demands, including a proper hike in the pensions, reservations in admissions to various colleges and institutions and extension of other facilities, had been lying unheeded so far. Some of the speakers alleged that there had been gross discrimination in the matter of the selection of awardees on the occasion of the Independence Day or the Republic Day. The meeting resolved that if the present state of affairs continued, they would have to raise their voice and fight for their rights like they had done during the freedom struggle. A former MP, Mr Ramkishan Gupta, Mr Sadhu Ram, Mr Puran Chand Azad and Mr Roshan Lal Vyas were among the main speakers. They asked the VC of MD University, who was also invited to the meeting, to take care of the interests of freedom fighters in university affairs. In a letter to the Prime Minister, Mr Atal Behari Vajpayee, Mr Batra, a Congress leader, has said that despite the case, the Chief Minister failed to ask him to resign. He said it was the moral duty of Mr Sri Kishan Dass to give up the post himself so that investigations against him could be conducted properly. Mr Batra has asked the Prime Minister to intervene in the issue. He said it had been a tradition that when a minister was implicated in any such case he either resign suo motu or was sacked. Some other opposition leaders have also demanded the sack of the minister. These include Dr Virender Pal and Mr Inder Singh Dhull of the Indian National Lok Dal, Mr Jagdish Kapoor, Congress, Mr Inderjit Singh, CPM, Mr Krishan Murti Hooda and Mr Ajit Singh Hooda, HLD (R). They also alleged that there was an acute scarcity of drinking water and that the inmates were not getting facilities as listed to the jail manual. They said they were staying in a dilapidated building which had already been declared unsafe by the PWD (B&R) and that the construction work on the new jail had been going on for the past several years. Mr Justice Swatantar Kumar of the Punjab and Haryana High Court had also, during the annual inspection held last year, urged the state government to complete the new building at the earliest. When contacted, Mr Zile Singh Kundu, Jail Superintendent, said though there were handpumps and taps inside the jail, a tanker had been pressed into service to meet the demand for water, adding that the grievances of the inmates would be redressed soon. He said the jail was over-crowded and that was causing to a lot of problems. The capacity of the jail was only 100 whereas 300 inmates were staying there at present. According to the FIR registered against the three, an amount of Rs 13 lakh was given in cash to Mr J.M. Singh, husband of Jagjit Kaur, one of the applicants, by way of loan because Mr Singh, now deceased, wanted to purchase a house. When the money was demanded back, Jagjit Kaur issued a cheque for Rs 10 lakh, which bounced. The cheque was returned to Jagjit Kaur but she neither returned the cheque nor paid the amount. The other two accused, Narain Singh and Harmeet Singh, are manager and a son-in-law of Jagjit Kaur and were allegedly involved in the affair. The judge, while dismissing the bail applications of the three applicants, said that he was of the view that since the investigation was in progress and a substantial sum was involved there appeared to be no ground for anticipatory bail. According to society sources, the special meeting had been called to discuss affairs of Vaish Engineering College being managed by the society. It is reported that supporters of Mr Mahadev Prasad and Mr Jagmohan Mittal "exchanged blows", with each other. Mr Mahadev is the in charge of the college at present. The matter was, however, solved and both groups calmed down. According to a report, Gaurav, who has been admitted in a hospital in Delhi, was reported to be battling for life after he had gone in coma after taking the poison. All five accused named in the FIR and the teenaged girl had been reported absconding after the incident. The father of the girl in his complaint had charged that the five youths allegedly had abducted his daughter in a car and taken her to an unknown destination. The Panchayat bhavan , the venue of the workers' meeting, has been given a facelift. Roads have been repaired, roundabouts painted, pavements cleared of enchroachments, weeds and grass; storm water ducts scavanged and opened. True to their routine, officials of the PWD ( B&R), the Sonepat Municipal Council, the Public Health Department, the Market Committee and the Haryana State Electricity Board have been working overtime for the past few days to spruce up the areas from where the motorcade of the Chief Minister would pass. Many office-bearers of the Federation of All Residents Welfare Association have urged the Chief Minister to visit lanes and roads, particularly the sabzi mandi area and see for himself and mud, pot holed and dug up roads and overflowing sewers in other residential areas.